As your kids might have phrased it when they were younger (if they talked about shower enclosures…which would have been kind of strange), “Do you have the odd shaped shower from “H-E-double hockey sticks?” Do you think the person who designed this “gem” must have been on something because custom shaped doesn’t even do it justice! It’s cramped and dark and the old tile grout joints look horrendous. 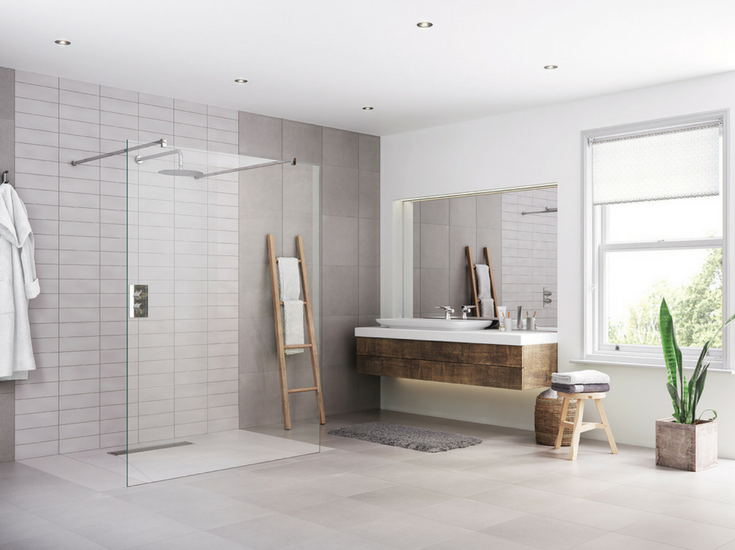 You’d like to just throw your hands up and say HELP – but that strategy alone won’t be enough to create a new shower you’ll actually want to use and won’t kill your budget. So how can you tackle this mysterious odd-shaped shower puzzle you’ve got? In the article below I’d like to take you through a 5-step process to remodel your crazy custom shower into a space you WILL want to use. 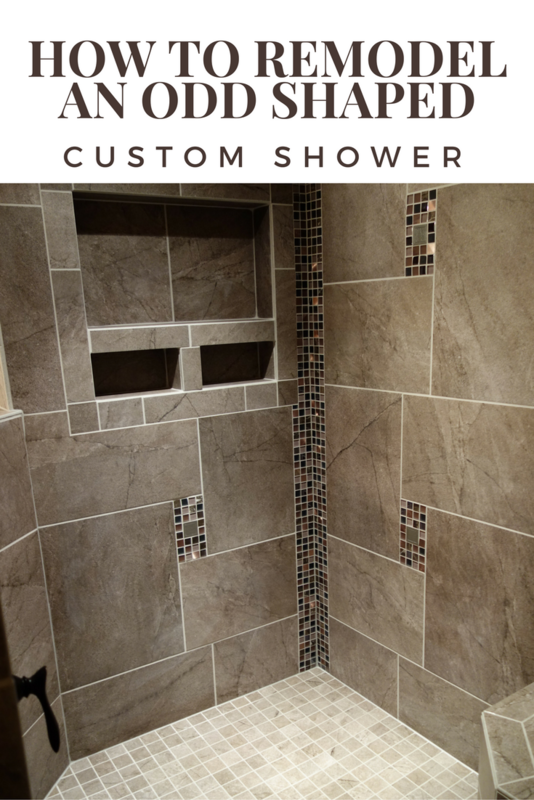 I wish I could tell you you’ll also be able to get this shower done as cost effectively as a standard alcove 60 x 36 kit you see at your local home center store – but that’s a pipe dream (sorry to burst your bubble here – but I need to give it to you straight!). Without further delay let’s dig into these 5 steps. The surest way for a bad result is to get the sledgehammer out and start tearing out your base, tile walls or weird arched entrance to your shower (or hire the first contractor who shows up on time and is walking and breathing). Let your fingers do the clicking or get on the phone and seek advice first. You’ll need to determine if any walls you are considering tearing down are structural. If you want to keep the shower pan the same shape as you have today research what will be the best type of shower base (a custom site built approach or a pre-made and pre-sloped base?). 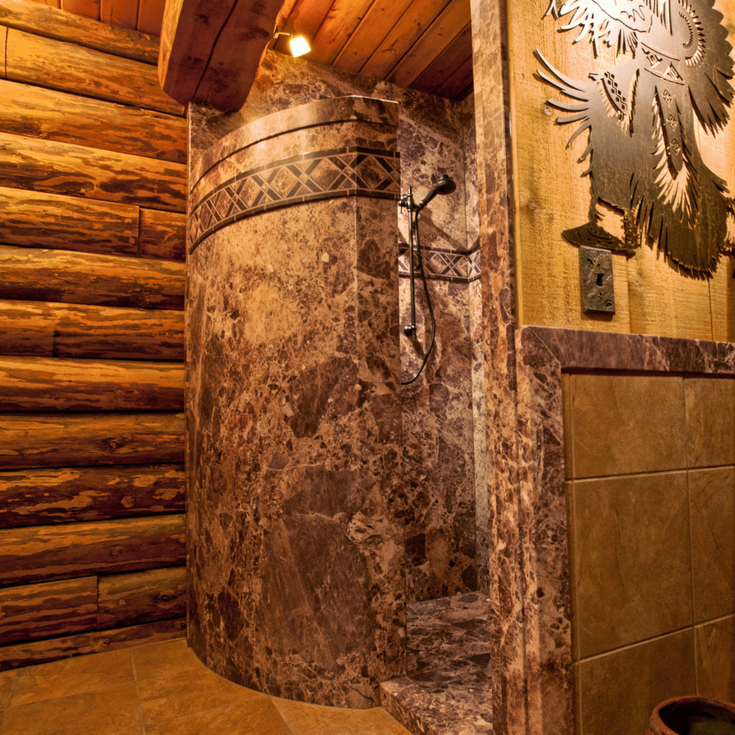 Ask yourself, “what bugs me about this shower?” Does it have a place to sit down? Is there no place to put soap and shampoo which makes it unsafe and slippery? Is it hard to enter because there is a big 4 – 6” step over curb to climb over? Before doing anything research various custom shower pan options, accessories and/or bring in a reputable bathroom remodeling contractor to get their ideas. Remember an ounce of research can be worth a pound of cure. More initial research will = less total project cost irrespective of whether you do-it-yourself or hire a professional. You and I may spend thousands, tens of thousands or up to several hundred thousand dollars on education for our kids (I’ve got 3 kids and am living through these exorbitant education costs right now) to give them a firm foundation for their future lives and careers. Why do we do this? Is it because we want to wear the cool logoed sweatshirt which says “Big Expensive U.” around the house? More likely it’s because we want to give them something tangible (an education) they can build their lives on. A solid surface or cultured marble base – These bases can be formed into virtually any shape and are pre-sloped (to ensure drainage will be consistent). Many manufacturers even offer a lifetime product warranty. With these systems, you’re not limited to a boring white or beige color. One line we use has over 35 different colors. You can get these pans in matte finishes with solid colors, granite finishes and subtle marble patterns. 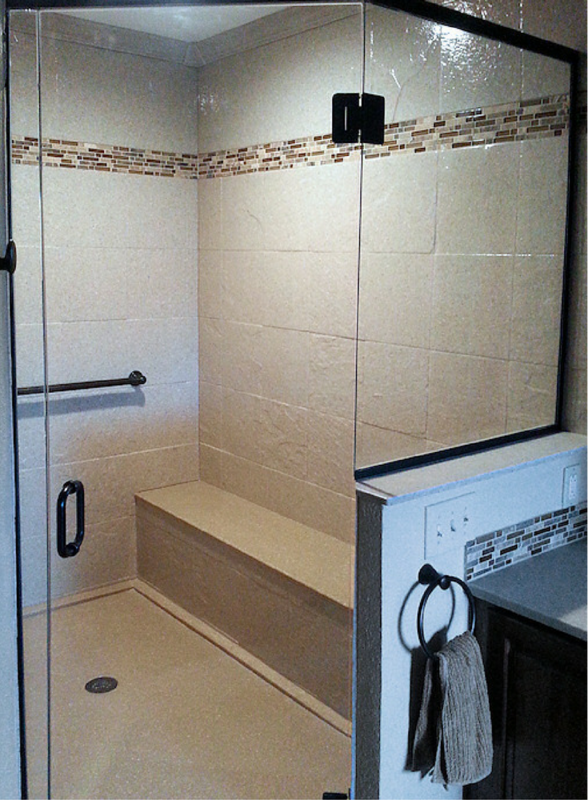 A one level shower – What’s cool about the one level shower is you can eliminate the curb and make it safer to enter. 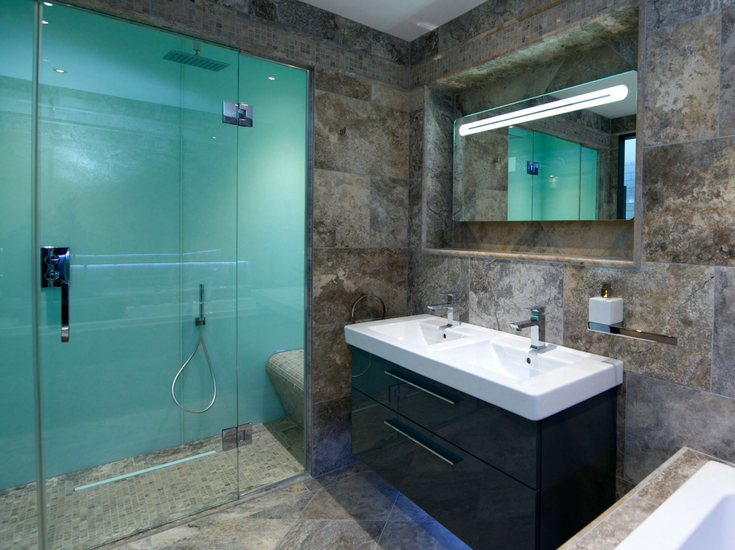 With these “wet room” systems you’ll waterproof the entire bathroom to get rid of any water concerns. Check out the in process and completed pictures of this system below. A waterproof ready for tile base – If your space requires a custom pan but you still like the look of tile, a custom ready for tile pan takes the guess-work out of building the base on site. Your new tile can simply be thin set right over the waterproof top surface (this pan takes the high degree of difficulty out of the installation process and it’s waterproofed and pre-sloped). So now that you’ve got the “foundation” (shower pan) figured out it’s time to “think up” and get a game-plan for the walls. 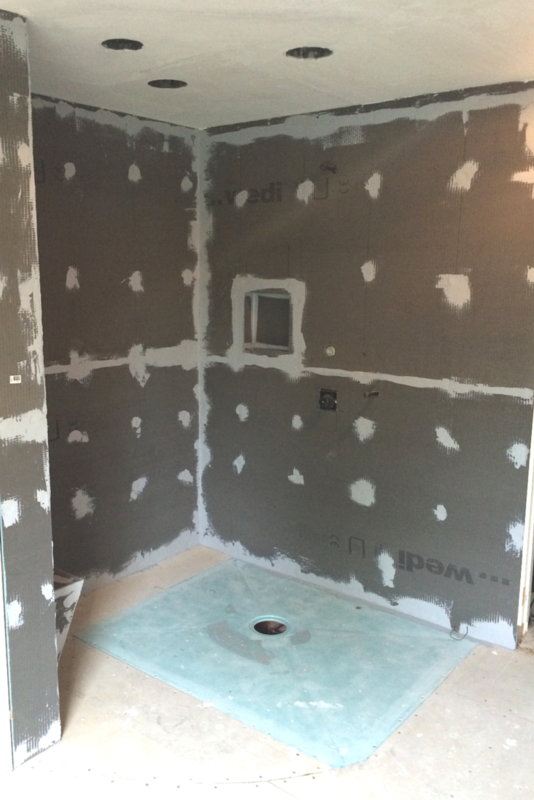 If your walls are angled or curved, you need to figure out how you’re going to waterproof them to make sure no moisture will mess up the framing behind the shower walls. You’ll want to use different strategies (and products) based on if your building a tile shower or are using decorative wall panels. Let’s look at both options. For a tile shower you can obviously cut tiles or use sheets of smaller mosaic tiles to work around curved or angled walls. One key is to make sure if any water goes through the grout joints it doesn’t destroy any surface behind the walls or underneath the pan. The best way our remodeling division has found to do this is to use waterproof wall backer systems like Schluter or Wedi. They aren’t hard to work with and provide waterproof protection for you. What’s nice about shower surround panels is many offer custom shaped (45 degree, 135 degree) angle pieces to provide additional waterproofing protection where the wall angles occur or some of the wall panel lines (like the PVC composite walls shown below) can be formed to work with a gently curved wall. What’s cool today is fashionable tile shower style trends and low maintenance go hand in hand since large format tiles are architecturally hot. These bigger tiles allow you to cut down on the number of grout joints and will lessen your cleaning time. 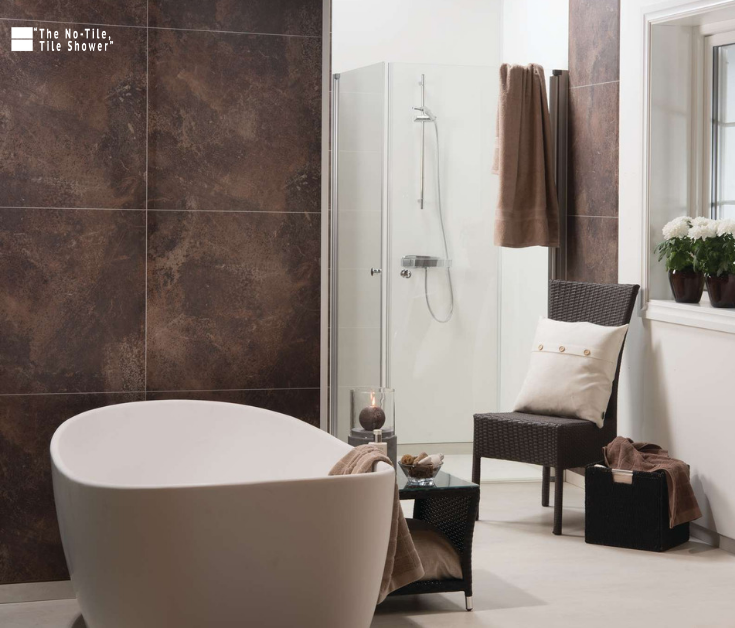 If you really want to get this ‘less is more’ theme in high-gear go with with contemporary waterproof wall panels. These laminate units look just like tile, but there is ZERO (here that right again – ZERO) maintenance to them. Now that’s a cool idea! On the other hand, if you’ve had it with grout (you would certainly not be alone here) the number of shower wall panels options are growing exponentially. 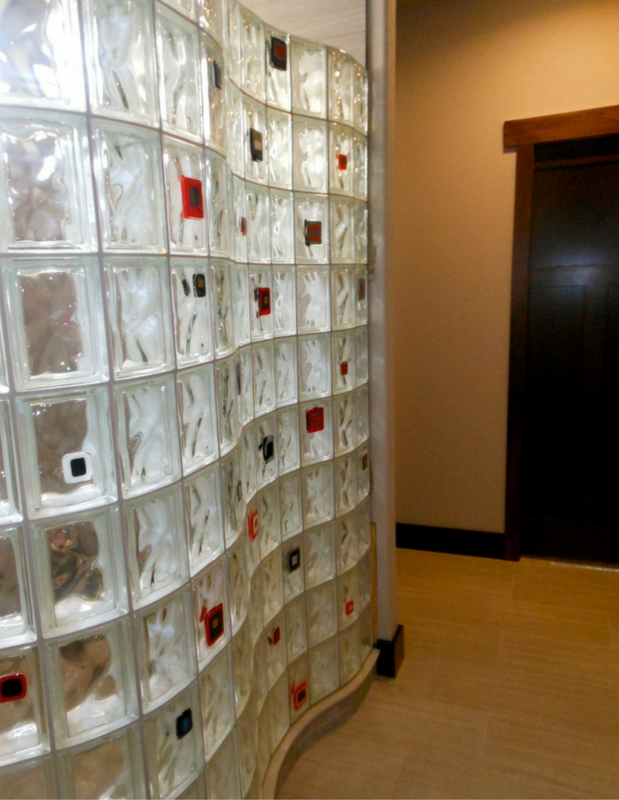 The most popular ones we see are solid surface, cultured marble, PVC composite panels and sleek high gloss wall panels. They may be initially more expensive than tile – but will save you maintenance costs and hassle during your years of owning the home. When you’re remodeling a custom shower it’s going to be expensive – so why settle for a “utilitarian” space when you can really bring the project to a glorious finish line by creating a spa-experience. Multiple shower heads – Imagine coming home after work and getting a “mini-message” from the multiple shower heads in your shower. You could even purchase a cool shower head where you can play your favorite music in the shower! This could be very cool – but it wouldn’t help my family with my “glorious” singing (ha! ha!). A place to sit down and relax – A corner or bench seat (either stationary or removable from the shower) can allow you to relax in the shower vs. your showers always being a rushed experience. Make sure to think through the placement, design and type of seating before you pick out your shower pan. 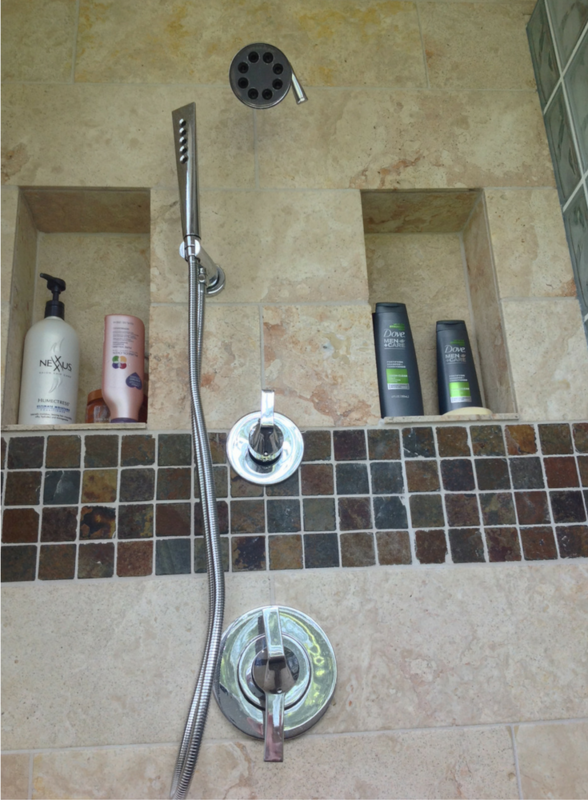 The shower system used below was completely groutless to save on maintenance time. A home for your various products – As you get older this “beauty-thing” becomes more complicated. You have more “lotions and potions” to store in the shower. If your custom shower is small, consider designing recessed niches so you have room for your products without taking away any shower space. 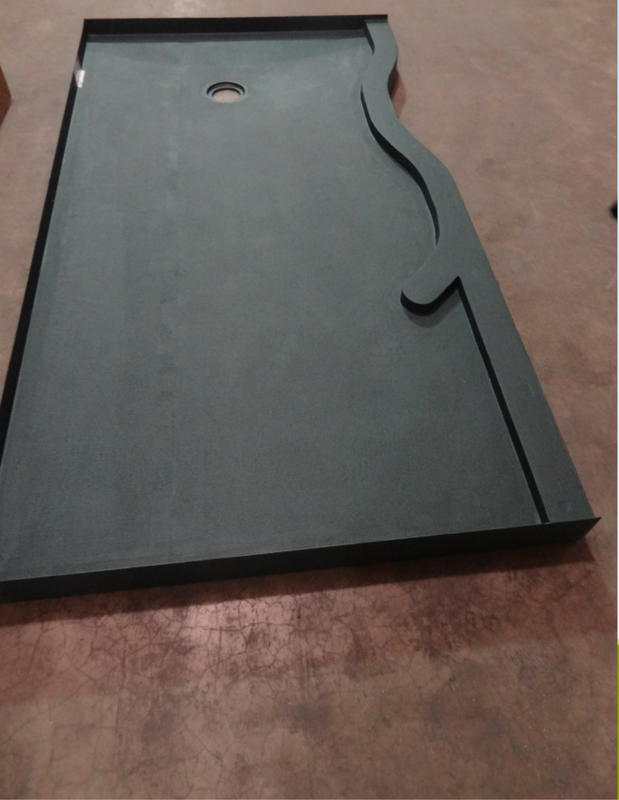 An odd shaped custom shower doesn’t mean you have to throw your arms up in disgust and say “Why ME!” With the proper planning a custom shape can not only be cool and sleek – but it can be safe and comfortable for you and your family. 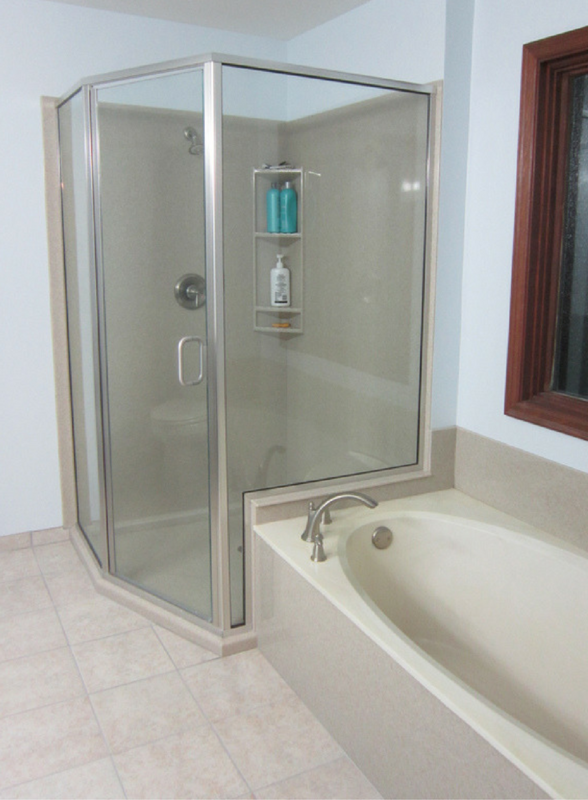 Do you need any help with a custom shower pan, wall system or bathroom remodeling project. Feel free to call our numbers below for both nationwide wholesale of custom shower products or a local Cleveland bathroom remodeling project. 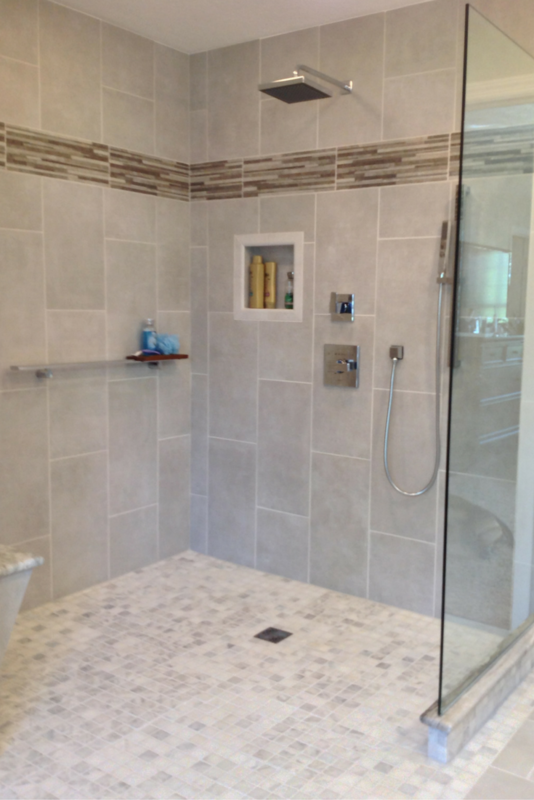 If you’re looking for information or an estimate on remodeling a shower or nationwide material supply for the various wall panels and shower bases mentioned above call Cleveland Design and Remodeling (216-531-6085), or for nationwide supply Innovate Building Solutions (877-668-5888). Just read this article. It’s extremely helpful as I begin to contemplate a bath remodel that has a lot of challenges as the current shower is an odd shape as is the bathroom. Thanks so much. Will refer to your website again.